My usual objective in these reviews is to describe an excursion to a restaurant that’s relatively new or one with which I’m unfamiliar. I do this unannounced and, ideally, unrecognized as a reviewer. The goal is to achieve a typical dining experience afforded by the establishment to all of its guests. Hopefully, it will come with elements of discovery and dining adventure. This narrative, however, is a departure from that convention, and it would be less than forthcoming if I didn’t begin by stating my fondness for El Basha; it’s one of a very few area restaurants I cite when people ask me where I most often dine. Most evenings at El Basha are spent with friends and neighbors discussing the latest news and events. This makes the place feel a lot like home. But there must be reasons for our loyalty; to take stock of them, I paid a special visit to El Basha – an analytical mission of sorts. When one enters El Basha, the clamor of Park Avenue dissolves into a warm atmosphere of muted colors, wood paneling and soft music. And though a wall of large windows overlooks the avenue, heavy curtains shield much of the traffic and allow some view of the sidewalk. The dining room is bisected by the bar-lounge area, which attracts an after- work crowd for drinks and dinner. What really sets El Basha apart from other places are the management and staff. The hostess was ready with a warm welcome, and the waitstaff is professional and fun – repeat customers are often greeted by name. We were pleased to learn that Michael would wait on us this evening. The owner-manager, George Sakhat, usually wanders out of the kitchen at some point and offers the heartiest greeting in town. All of that goes only so far, though; it’s what’s happening in the kitchen and the dishes it sends out that tells the real story. At El Basha, the cuisine is Lebanese, so we ordered some of the basics and started with a combo of Homus and Baba Ghanouj. Both are thick dips served with triangles of chewy-fresh pita bread. The creamy-smooth homus, ground chickpeas flavored with tahini (toasted sesame sauce), had just the right touch of lemon to highlight its subtle flavors. My particular focus was the baba ghanouj, something I first experienced long ago at the legendary El Morocco restaurant. It’s made with smoked eggplant and tahini sauce, drizzled with olive oil and, at its best, tinged with fresh lemon. I crave the smoky bite and slightly lumpy texture. At El Basha, I’ve developed entrée favorites that make my order relatively predictable. My main lineup: Kafta Ka-bob, which is ground meat (beef and, perhaps, lamb) mixed with minced onion and parsley and then formed into oblongs, skewered and grilled with vegetables. Another is Fish Tarator, a very hearty plate of haddock filets sautéed with sliced onions and walnuts in a creamy tahini sauce. Tonight, I dialed it back to basic Lebanese with the Stuffed Grape Leaves and Baked Kibbee Combo. El Basha’s grape leaves appear in their standard form – deep-green leaves rolled around a mixture of rice and ground meat. However, they’re considerably better than most; the stuffing is firm, the deep-green leaves have texture and, again, the lemony flavor is fresh. After El Basha, you’ll never be satisfied with the mushy grape leaves you’re served elsewhere. Kibbee is another favorite at our table. It’s made in a large baking pan spread with a layer of fine bulgar wheat moistened till tender, then a layer of ground meat that’s topped with another layer of bulgar. Then,it’s baked till deep brown and served in diamond shaped wedges. The Lebanese have an exotic spice mix that makes this dish addictively delicious, especially when dipped in El Basha’s homemade yogurt. My friend’s entrée is proof that El Basha’s menu is much more versatile than simply Lebanese cuisine. His Grilled Tuna was gorgeous to behold and proved to be a luscious dining experience. This thick chunk of sushi-grade tuna was fast-seared on just the edges so that its center was ruby red. A thick crust of roasted sesame seeds added a rich flavor dimension. Juicy and fall-apart fresh, the portion bordered on outrageously large! It was served with a big dab of sinus-clearing wasabi and soy dipping sauce, along with grilled vegetables and rice pilaf. 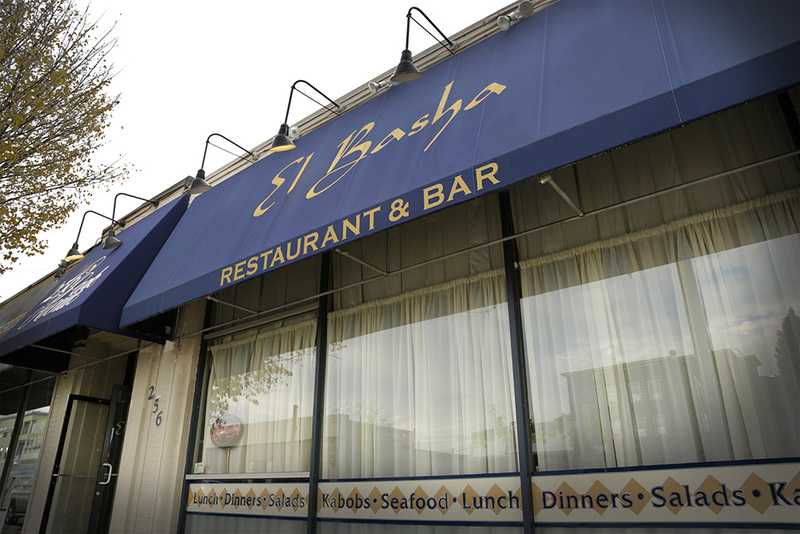 Restaurant talk often turns to the question, “Who has the best Middle Eastern cuisine?” There are three other El Basha locations: Belmont Street in Worcester, Westborough and Sudbury that are run by George’s brothers, John and Elie Sakhat. I’ve dined in a couple of them and wouldn’t want to judge who’s best. But only one feels like home.